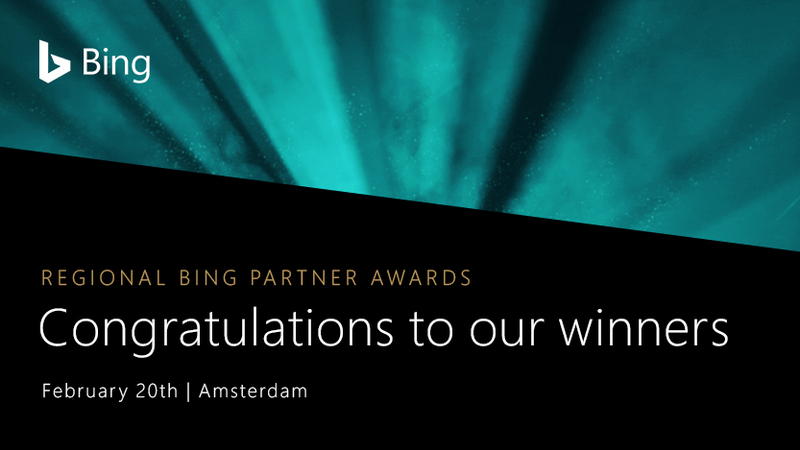 For the first time ever, we’ll turn the searchlight on our most successful and dedicated partner agencies and their employees across Europe and Asia Pacific at the 2019 Regional Bing Partner Awards. It's their focus to ensure clients are showing up in all the right places, in all the most impactful ways. On February 20th, we will give back and honour the passionate work of advertising agencies, technology partners and search professionals. We will celebrate the success of all our winners at the exclusive award ceremony to be held at Westergasfabriek in Amsterdam, Netherlands. The 2019 Regional Bing Partner Awards recognises achievements in 5 categories highlighting the outstanding work of individuals, teams and agencies across the search advertising industry. Our jury of international experts had the extraordinary task of choosing winning nominations out of a record number of submissions. Categories and finalists appear below and the list of award categories with detailed descriptions is available on the Bing Partner Awards Website. Awarded to an agency employee (with national influence) who excels in championing Search practice in the industry and media and shows a true commitment to partnering with and investing in Bing Ads. Awarded to the partner best leveraging Bing Ads tools and insights for smart, innovative optimisation solutions. Awarded to the partner demonstrating the most innovative strategies and thinking to move their business success forward with Microsoft Advertising products. Awarded to a rising agency partner, who has shown an exceptional acceleration and growth on the Bing Network. Inspired thinking, business solutions and focus to deliver top results for their clients were key criterias for success. This category winner will be announced at the Regional Partner Awards. Congratulations to all the Asia-Pacific winners of Regional Bing Partner Awards 2019! We look forward to unveiling the Agency Of The Year (Asia Pacific) and celebrating your achievements in Amsterdam! Subscribe to the Bing Beat and learn about what's happening at Bing and Microsoft.